- Start with some arugula on the bottom. 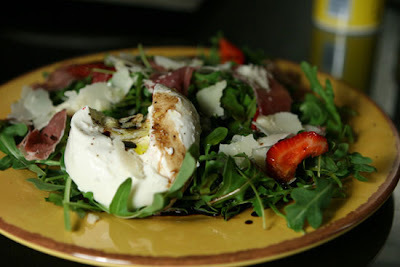 - Add topped strawberries, and sprinkle some balsamic vinegar over. The secret to a great salad is in the quality and freshness of the ingredients. When it comes to the balsamic vinegar, I like to use the WeOlive Blueberry Balsamic Vinegar. - Add prosciutto and parmesan, then a bit of olive oil and ground pepper. - Add the burrata off-center. Finish by cutting it open, and topping it with a bit of balsamic vinegar, parmesan cheese, olive oil, and pepper. - Not much to do here, as you'll have a large variety of colors. If anything, present it on a nice (square or colorful) plate, or next to a glass of good wine. Your comment just blew me away, Kathy - it such a pleasure to hear from you. Making burrata on your own sounds like quite an accomplishment, or better said, it sounds like a lot of love for great food and for those you share it with. It's really comments such as yours that keep me going. Thank you. I'll do my best to post more delicious recipes soon.